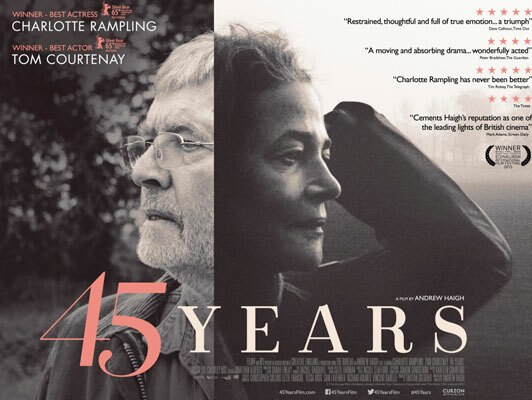 Rampling plays Kate Mercer, a quiet, reserved British woman preparing a gala anniversary party to celebrate 45 years of marriage to Geoff (Tom Courtenay). 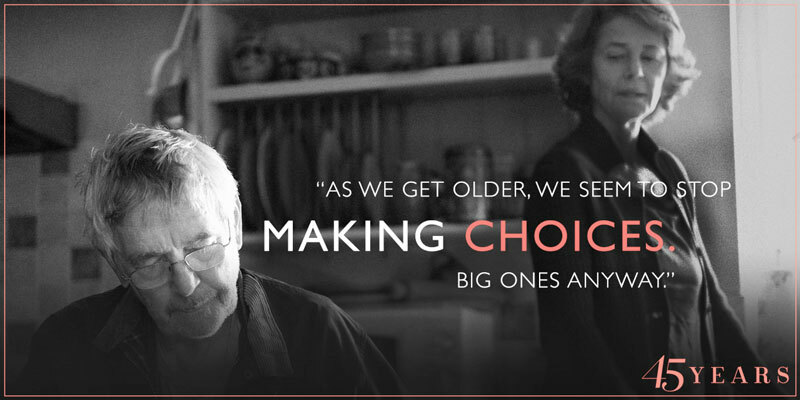 A retired teacher, she and Geoff find their well-ordered life of domesticity threatened by a trauma that occurred shortly before they began dating in the 1960s. A letter arrives, announcing that the body of his former girlfriend, "my Katya", has been located in an ice bed on a rugged Swiss mountainside. This marks the beginning of a long week for the settled couple, who each react to the news in their own subdued way: Geoff begins smoking again and becomes more preoccupied with the notion of returning to Switzerland to claim her remains; while Kate goes about her day seemingly concerned only about the approaching party. 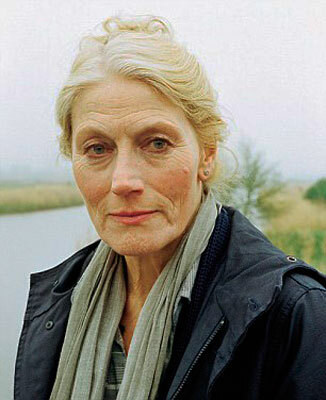 At first glance it would appear that the only test markers in 45 Years are the sporadic conversations between Kate and her long-time friend, Lena (Geraldine James). Lena happily rattles on about Geoff, their marriage and the party, usually without pausing for breath. Kate wonders aloud about the speech Geoff will make during the festivities, and Lena assures her that he'll be so emotionally invested that he'll cry, "like they all do". These conversations indicate that 45 Years failed the Bechdal Test, as the women focus their attention on Geoff, the main male character. The film continues to center around the week of the party, as Kate marks her days focusing on her rather boring husband, who spends his days dithering about looking helpless. The week ends on Saturday, with the couple being feted at their 45th wedding celebration. It's only at the very end of the film, when Kate yanks her hand away from Geoff, that her story is revealed to us through our own internal recollections. As I sat looking at the blank screen, I kept thinking, "Is this really all there is to this flat, one-dimensional story?" Then, as if I were watching the film in reverse, I began to see that the entire film was a Bechdal Test, but the two women having the conversation were Kate and myself, the viewer, about the choices married women make once they shake off the rice and pack up the wedding dress. 45 Years shows us a marriage only half realized, since Geoff is the only one who has a suitcase full of memories and life seems to revolved around him. The love affair between himself and Katya ended on the day she fell to her death, but as Kate discovers, Katya was also pregnant. Kate begins each day puttering around after Geoff, quietly inquiring about his needs. They have no children, and the family dog is almost as silent as she is. Walks with Geoff along the East Anglia countryside and her frequent trips into town bring her rather humdrum day to a close. At night they share a few careful sentences that end with Geoff flatly stating "I'm tired" and then it's lights out. Even the late date for their anniversary party was changed, is due to Geoff's health, five years earlier. Every time Geoff attempts to share something about Katya, Kate impatiently cuts him off. We're left to wonder if it's because she's jealous of a ghost or if she's getting angry that she has nothing to share of her own. When she goes upstairs into the cramped attic to pour over his suitcase of travel mementos and view old slides of a pregnant Katya, we begin to understand just how small this woman's life has become to her. Kate finally confronts him about his plans to visit Switzerland after she discovers he's gone to a travel agency in town. Geoff assures her that it was only a fool's errand and pledges to become more actively involved in their marriage. As she gets ready for the big night, she discovers a necklace he's left for her as a present. After thanking him, she apologizes for not getting him anything, letting him know - almost as an afterthought - that she was considering a watch. "I don't like to mark time", he shrugs - and here then is the first hint of what marriage for her has really been for Kate - marking time. As the evening progresses we see Kate, dutifully beside her Geoff, yet it's clear she's becoming more uncomfortable with the passage of time. During his sentimental speech he refers to the choices one makes when they're young as having important consequences, and yes, he predictably breaks down in tears. No one expects Kate to make a speech, so all that's left for them to do is lead the first dance. Now purged of his past sorrow, Geoff happily sings along with the strains of ‘their’ song, “Smoke Gets in Your Eyes”, and Kate looks like she has finally awakened from a long sleep, only to find - like the frozen Katya - that she's wasted 45 years of her life. 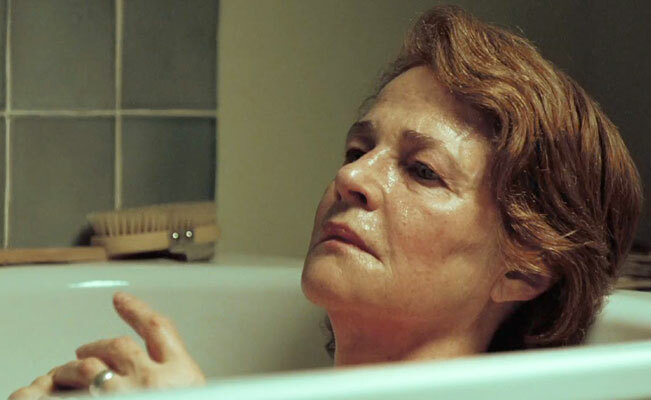 The last few frames of 45 Years tells a universal story of millions of women, past and present, who have looked up to realize that they've buried themselves alive in a relationship designed to make only one person happy. Feeling Kate's discomfort and disillusionment brings home the message that our choices of how we want to live our lives is another sort of Bechdal Test, just waiting to happen. * Also known as the Bechdel–Wallace test, the test is named after the American cartoonist Alison Bechdel, in whose comic strip Dykes to Watch Out For it first appeared in 1985. Bechdel credited the idea to a friend, Liz Wallace, and to the writings of Virginia Woolf. After the test became more widely discussed in the 2000s, a number of variants and tests inspired by it have been introduced. The test is used as an indicator for the active presence of women in films and other fiction, and to call attention to gender inequality in fiction.